In my quest to make the NICU a bit more bearable for parents, I need to share with you a key ingredient to NICU happiness - personalize the space. Make it beautiful. Make it yours. So - we've got to get the NICU to feel a little more like that nursery you dreamed of when you found out you were pregnant. The sweet artwork, adorable stuffed animals, cozy blankets, comforting accessories you would have at home... something that feels good to you. It will help your stress level, it will give you a sense of control and of belonging, which in the end helps everyone, especially your baby. Seem impossible? I think not. And I think it's worth it. Anything you can to do make the environment more pleasant will help you through this incredibly tough time. 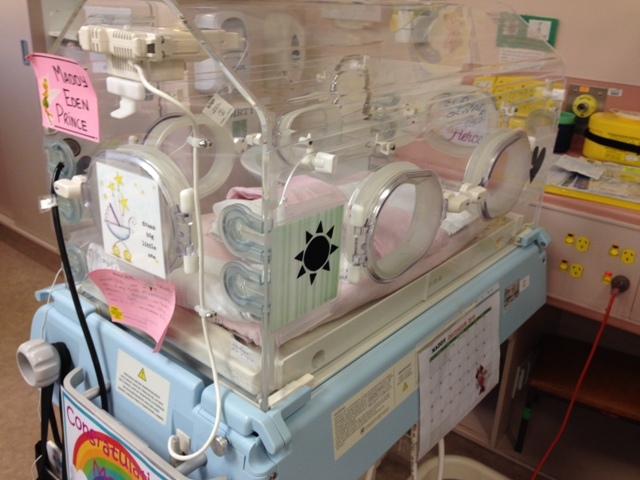 Most NICU's will support you, either a little or a lot, in your efforts to personalize your baby's space. I am going to suggest that you take it upon yourself to make the effort. Bring photos from home - of mommy & daddy, siblings, grandparents, even pets! Ask to hang them on the crib, isolette, or nearby. Have siblings write notes to the baby and hang them at the bedside. I've created an entire line of NICU friendly art, which you can use to decorate your baby's bedside. With inspiring quotes and sweet illustrations, they bring much needed hope & joy to any NICU bed. And they're laminated, which is a must in the NICU! Make a name card for your baby's bed if your NICU doesn't provide one. If there is space in the room or under the crib, you can ask about bringing in your own baskets or organizing bins to help keep blankets, diapers, clothes and other necessities organized in a cute way. My new favorite trick - bring in "Fairy Lights" to add soft lighting for nighttime feedings if your NICU will allow it (see my blog post about using fairy lights in the NICU here). My only advice is this - be diplomatic. Ask what will work and what won't, rather than just barging in with armloads of stuff to put at the bedside. Work together with your NICU team to make the best of it! But don't be afraid to be firm and clear - you want to make the space happier, friendlier, and more like home. Certain items won't work well at some stages (bright prints for preemies will be overstimulating, clothes are not possible for some preemies, surgical patients, etc), so just ask. If one thing won't work, try another. Try to make the space yours. Some nurses may resist change, but this is your experience and you have a right to try to make it better.